The preparations for Easter dinner have begun! 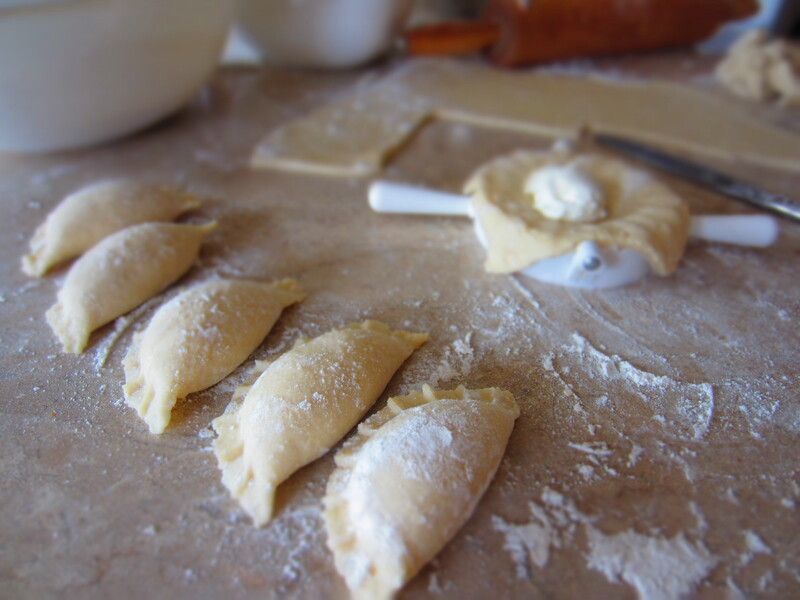 Pierogi have been made for Easter dinner as one of the Polish traditions in family. The cheese filled have been my favorite since I was a kid! 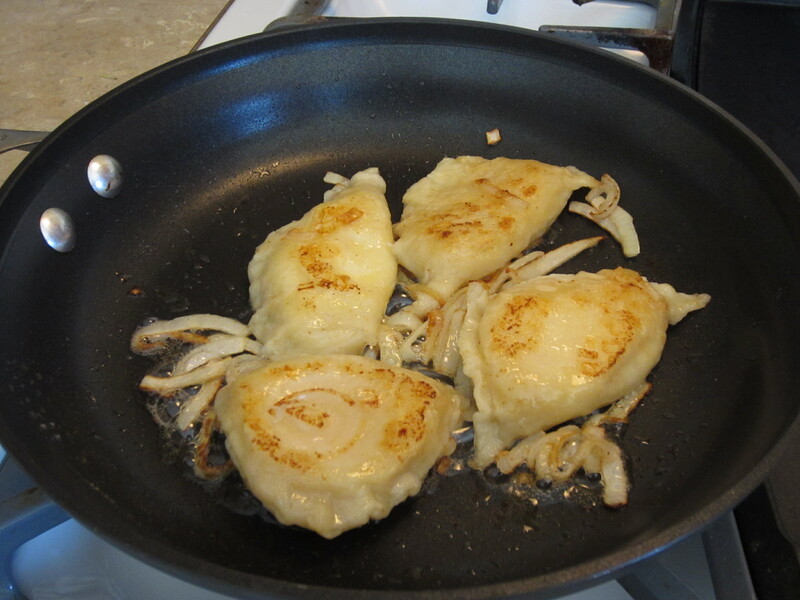 Pierogi can also be filled with potatoes, sauerkraut, ground meat and fruit. My family would serve them along side a baked ham and Polish sausage. I can even remember helping my grandmother stuffing the sausage by hand. My Polish family has been in the Chicagoland area for 4 (and now 5) generations. This is one recipe that has been handed down and I am honored to know how to make them from scratch, just like my grandma tought me. They are actually easy to make! 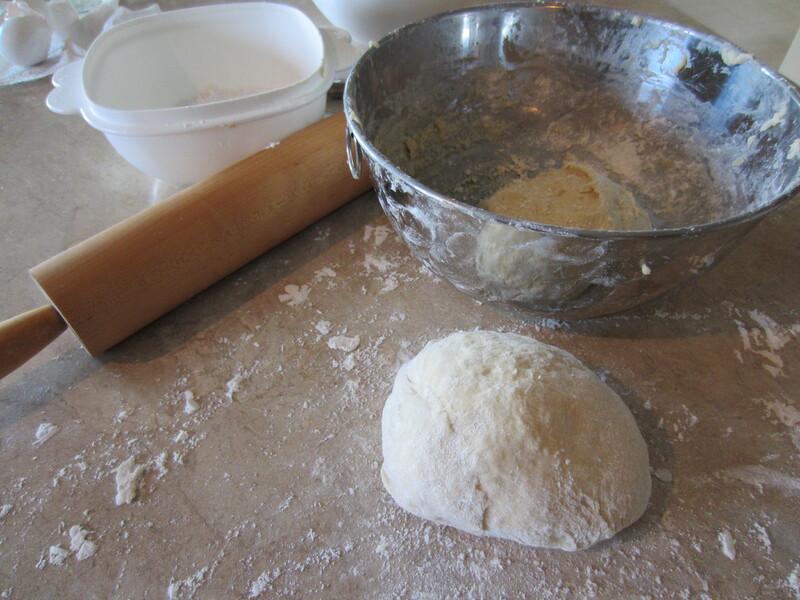 Mix all ingredients and knead on a well floured surface. Bring a large pot of water to boil and add 1 tsp. salt. Cut the dough in half and roll out on a well floured surface. The trick is not to roll the dough too thin because the filling could poke through. 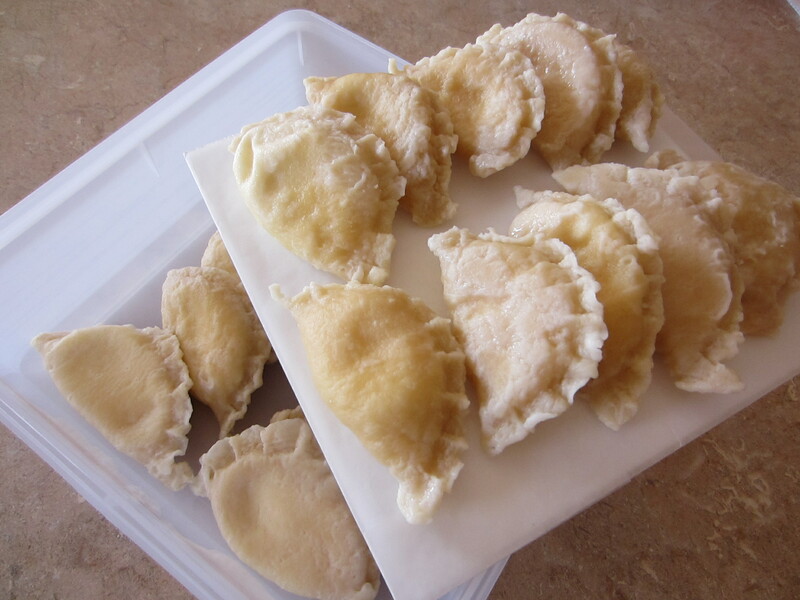 When my grandmother tought me, we used to cut, fill and crimp the pierogi by hand. A few years back, I found this inexpensive kitchen utensil called a dumpling crimper that makes the process a lot quicker. Cut a piece of the dough large enough to fit over the handy dumpling crimper. Place a teaspoon full of the cheese filling into the middle and carefully close the crimper. Pull off the remaining dough and tada…you have a beautiful dumpling! Once you have made a first batch of dumplings (around 8 dumplings), gently drop them into a pot of boiling water for 10-12 minutes. At first the dumplings will sink and after a couple of minutes they will float to the surface. Flip each dumpling over after 5 minutes. Let the boiled dumplings cool on a plate to remove the excess water. The steam will evaporate. At this point I am going to freeze my dumplings in a single layer (so they don’t stick together) until the day before the dinner. Using Sweet Stackers, I can get two trays of pierogi dumplings in one 3″ deep container – perfectly divided and condensed for storing in the refrigerator or freezer. These pierogi were made two weeks in advance and will be served for Easter dinner. The dumplings are cooked and are edible, but traditionally they are fried in butter and sliced onion. Oh, the pierogi smell so good, my mouth is watering! Wishing you all a Blessed Easter with family and friends! Those pierogi’s look amazing. My old roommate used to make them every weekend and I was absolutely addicted to them. Unfortunately, that also meant having to go to the gym more often to lose the extra pounds lol. I had these when I visited Poland – they were really yummy and yours look great. I’ve made other types of dumplings before but not Pierogis. I’m going to have to try these. These look so good!!!!! Thank you for posting. your Pierogis look perfect! it’s great you’re able to keep the traditions and recipes alive! Ah, dumpling crimper… thanks for the tip. (My first thought when seeing the photos was, “How did she get those to look so good?” While I’m polish it was only on my dad’s side and he didn’t cook, so I make these from frozen to take to international parties; I like to add minced mushroom when sautéing, btw. I guess I better improve my game, I’ll save your recipe! Thanks for your comment. Sauteed mushrooms would be yummy too! There is nothing that smells (and tastes) better than onions & mushrooms in butter! Wanted to let you know that I tried the pierogis and they turned out pretty delicious. I’ll have to post it soon (missing a few pics, dang it!) and ping back so you can see my inaugural effort!! That is great! I am glad they turned out good and delicious for you. 😉 I can’t wait to see your pics too! I am pulling mine from the freezer tomorrow and we will be eating pierogi on Sunday for our Easter dinner…I can’t wait. Hope you have a great weekend!